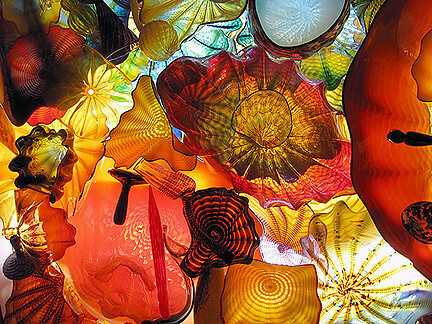 A feast for the eyes and joy for the heart, Chihuly makes my soul dance. 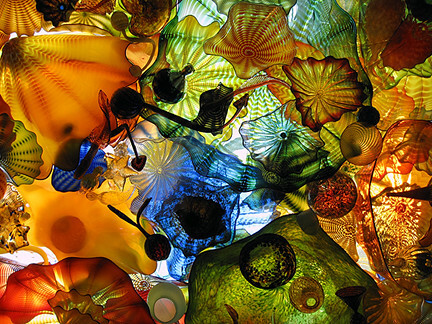 I've always loved glass art and I've been a fan of Chihuly for many years now. I never get tired of the forms and could watch those fascinating videos of the pieces being made all day. 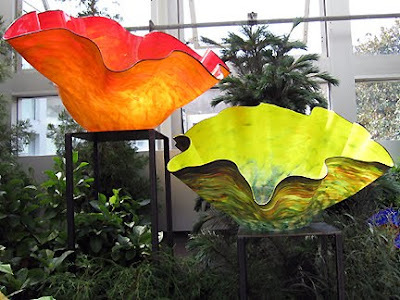 My friend Amy and I enjoyed a recent visit to Franklin Park (FP) Conservatory in Columbus to view Chihuly Reimagined. 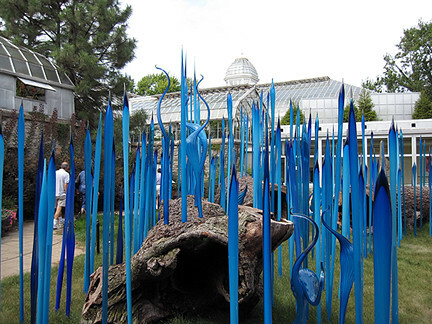 I'd visited FP two years ago with my other friend Amy for another Chihuly exhibit, but this one used different pieces entirely and I was as enthralled now as I was then. You never know what's around the corner. 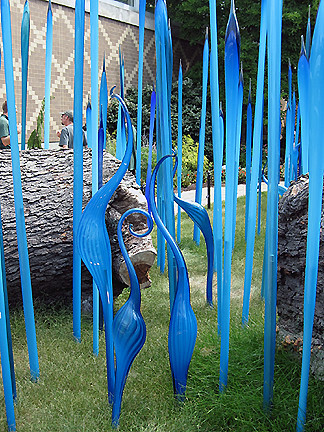 FP is a pretty cool place all the time, even without Chihuly artwork. 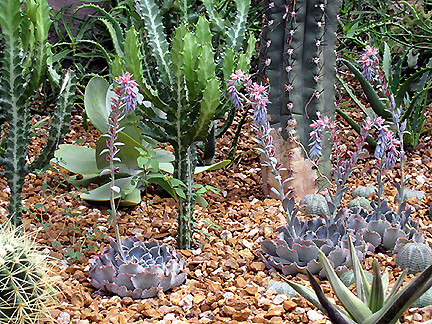 I love subtle colors and wonderful textures of these small succulents. Noogie! 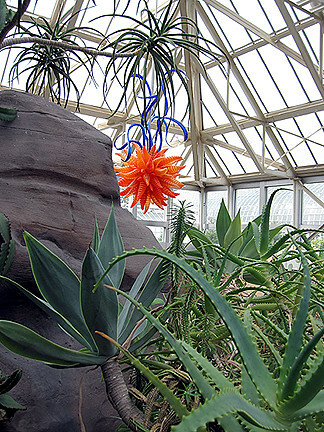 The plants are mostly indoors under glass, but there are also outdoor gardens. And of course a wonderful view at the conservatory itself. 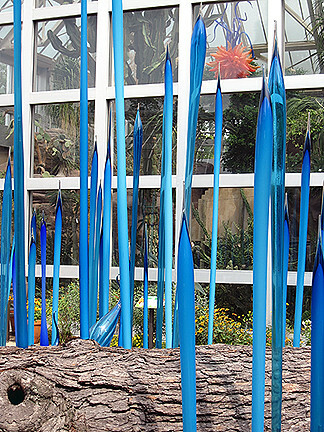 There are also courtyards, one of which had my favorite Chihuly installation, Blue Reeds and Marlins. I personally find this wonderful form more penguin than marlin, but what do I know? 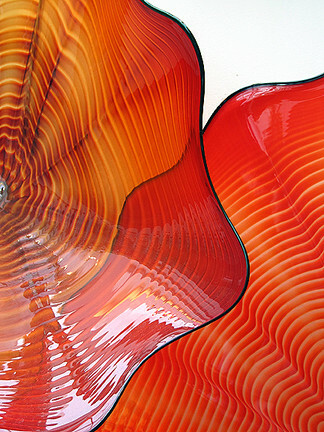 ...by whatever name, I adored the interplay of color and form with the glass and logs. I walked around the installation a few times and saw something new with each step. Alas, these blue forms inside the conservatory were indeed called blue herons and I find them just as impressive as their namesakes. 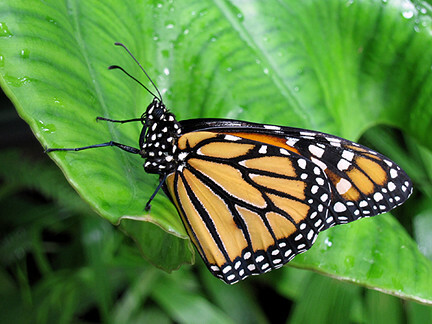 ...and it was easy, even for the non-steady-handed, to photograph many beauties. 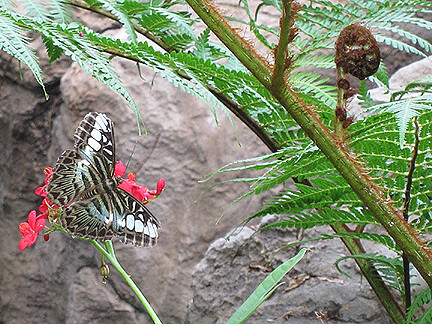 I love the unfurled fern combined with the flower and butterfly. It proves there's always natural art in a garden! 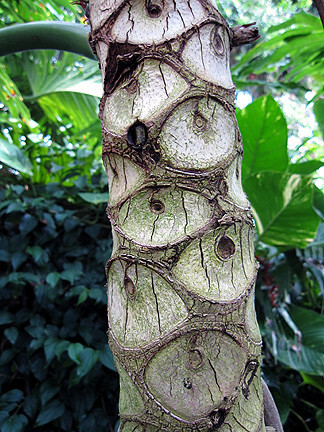 The wonderful texture and shape of this palm trunk are nature's artwork. As is this colorful tropical combination. 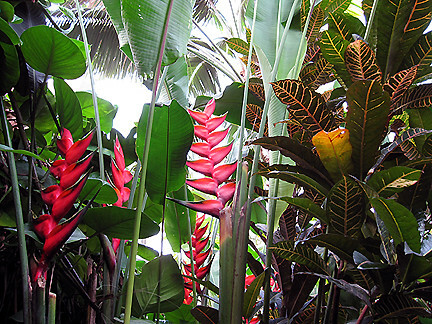 I always find tropicals fascinating; bright and with non-symmetrical shapes. Speaking of which, this sunset tower manged to both stand out of and blend into its surroundings. 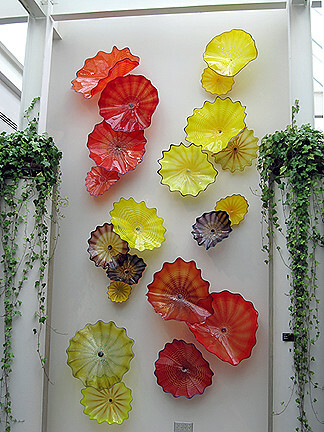 I love all its component forms and would love being on the team that travels around the world to install the pieces. Seriously. ...and how you see something new in every angle. These overlaps reminded me of Venn diagrams from waaaaay back in high school math class. I love the curly-cue tops of these vibrant red pieces. This Ikebana piece seems to be reaching toward the sunlight, wishing to be as tall as the surrounding palms (I know how it feels). 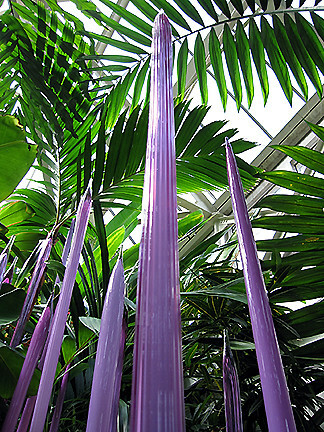 I love how these purple reeds fit in perfectly with the foliage, even though their shape and color are contrasting. 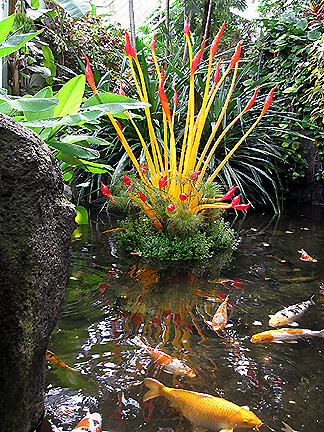 I love how he color of this torchier matches the goldfish and how its shape is reflected in ripples in the pond. I loved these multicolor macchia bowls (also shown in the first photo) and found it a real shame that I could conjure up no workable way to hide them in my purse and sneak them out of the garden not enjoy these wonderful pieces in my own garden. The most unexpected pieces were hidden in a dark section of the tropical room... you felt like you were walking through a dark cave and when you looked up, HELLO!, this wonderful back-lit display of garden glass. Stunning and breathtaking. Having seen a similar installation at the Kalamazoo Art Institute some three years earlier, I should have been prepared, but I wasn't. I was just as awestruck as the first time. And there wasn't just one, there were two! 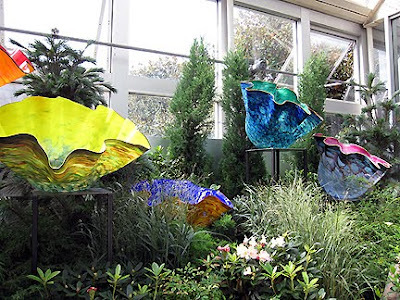 Believe it or not, there were a lot more Chihuly pieces than I'm showing here and (as it turns out while scouring the brochure for piece names) more pieces than we even saw, in parts of FP I didn't know existed! Wowser on that backlit garden glass! It looks like you are under sea! I simply love the fifth picture down with the cannas, sedum and Russian sage. My type of garden! I wish I had so much space to do it right like this. Awesome! Monica! 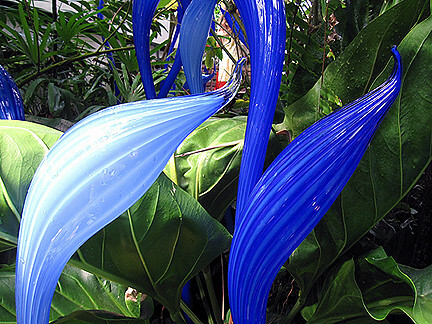 As one who has witnessed Chihuly's work in a Cactus Botanical garden in Arizona..I am always amazed how he creates masterpieces for the individual garden that features his works! The pieces that you show today are so unique I've NOT seen. 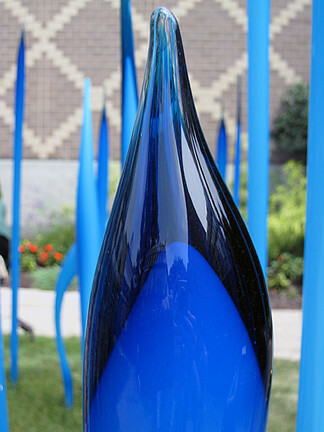 In AZ I did see the "blue reed" pieces and the "orange sun tower" but looks so different in this garden!! 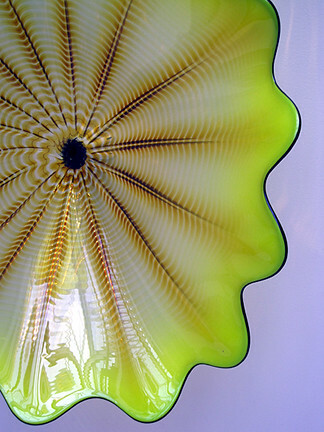 He is a genius with blowing glass! 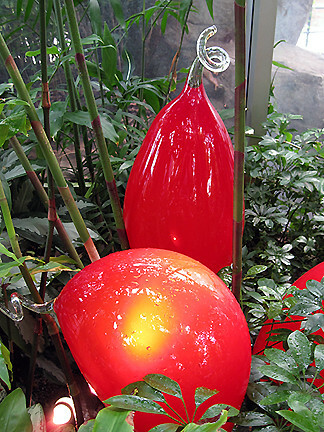 clored balls...oh how I loved that...will try to copy the idea in my garden next year...of course I can't afford Chihuly globes but I'm sure I can find clored glass balls somewhere! Thank You for sharing.Send me some energy Tues...as I'm having round #2! Hello Monica, eine wundervolle Reise hast Du hinter Dir. Toll dass Du uns in Deinen Posts mitnimmst. 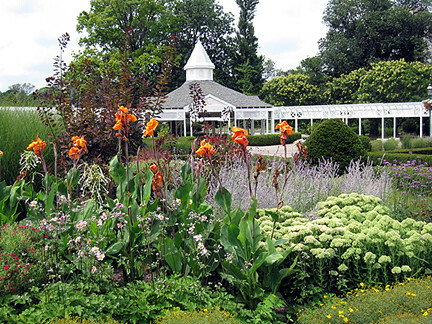 Super schöne Parks und Gärten, die wunderschönen Schmetterlinge, die Glaskunst und das "conservatory" ist eine super schöne nostalgische Architektur. Ein wunderschöner Post, wie alle anderen zuvor. 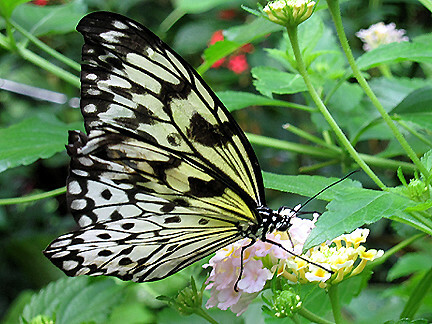 I love the butterfly and tropical plant pictures! Wow! I love these - especially the last one - it must have been an amazing experience. Your post makes me wish I had gone to the exhibit here in Chicago. But it was one of those "oh, I'll do it next week," things and I never got around to it. Wonderful pics. My fave was the last picture that looked like an underwater scene looking up at a bunch of jelly fish. OMG, the glass is beautiful! Love the blue heron glass and the purple and the multi colored, well you get the idea, oh yes, the flowers are pretty also, but the glass, oh the glass, absolutely beautiful, thanks for sharing! 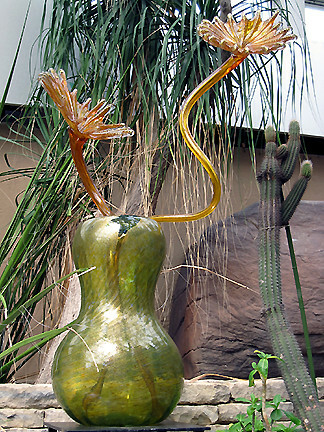 I became a big fan of Chihuly, too, when I saw his exhibit at the DBG in Phoenix last December. The extent of his work is just amazing. 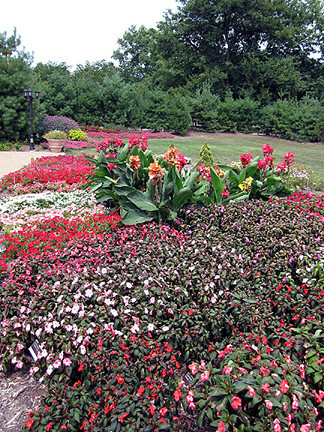 I recognize several of these pieces that were also on display in Phoenix, yet they look as though they were designed specifically for this garden. 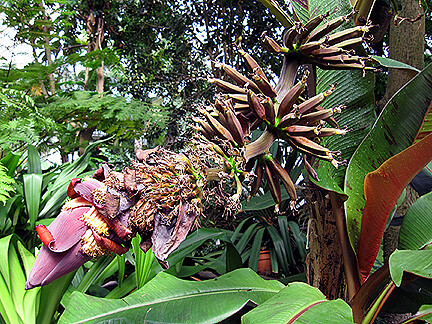 But there are also other pieces that are new to me--the last two photos in the tropical room are just gorgeous! What a day you must have had! Great photos, Monica, and thanks for the tip about AHS. I wasn't aware of this, but I'll have to look into it. Not only are several places in Chicago listed, but so are the DBG in Phoenix and several in Portland. I might save some money! It is a sign of good art when people can see things other than what the artist is portraying. It is good to have an open mind. 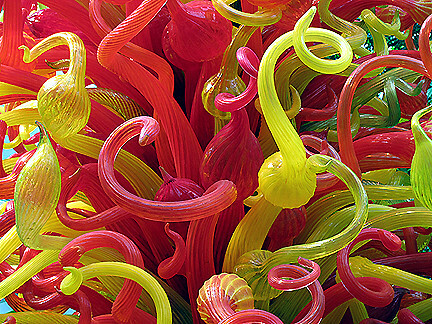 I have to admit that I've never heard of Chihuly ...... but I was blown away by his works just now! I just loved, well - all of it really - but especially the blue and the purple pieces. If I could have them in my garden I'd think I'd died and gone to heaven....! Great photos from underwater. What a treat that is. You took such good photos that now you can enjoy it over and over. The artist's imagination is remarkable. Thank you for sharing as I'll never be able to venture that way. What a feast for the senses Monica. 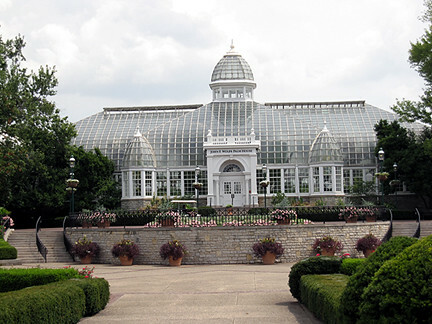 The conservatory building is gorgeous, as are the indoor plants and outdoor gardens. I love your play-on-words title. The glass just plain leaves me speachless. Your photos are great, and I can imagine how awesome this show must have been in person. Hard to pick a favorite but the setting put the fishy torchier at the top of my list. it in close up ! I enjoyed your post Monica - thank you. 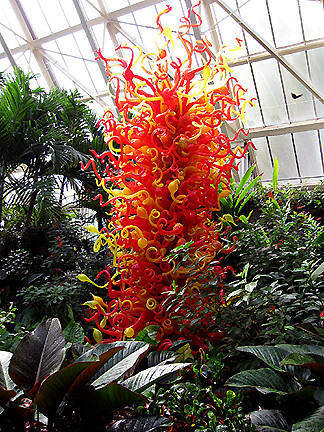 I saw the Chihuly exhibit at the Wright conservatory in Tacoma. I'm not normally a big fan of Chuhuly, but his works take on a whole new meaning in a naturalistic setting. I liked it very much. I also like the way he altered the exhibits to fit the different sites (I went to the web site). next time you go, please take me. Wow, thank you for sharing these images! I have never heard of that place, but I MUST see it one day! 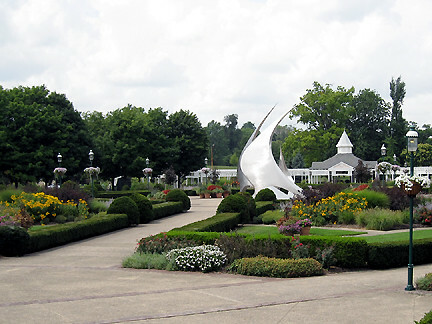 I really love the glasswork combined with gardens...just amazing!